APPLICATIONS CLOSED, Thanks for applying! If you are interested in joining us next time, you’re welcome to sign up for our travel mailing list below to receive an update when the program applications go live! Sign up for information on our other travel programs. Join us on an adventure as we travel to Greece to explore incredible archaeological sites, visit ancient oracles and cult temples, and marvel over sacred and mythological spaces thousands of years old. We'll travel through the bustling terracotta-colored city of Athens up through the mainland to a mountainous landscape peppered with olive and almond trees. We’ll visit mysterious ancient monasteries, experience local dishes of Kalabaka and Trikala, learn ancient craft woodworking and pottery techniques from local artisans, and much, much more! Our eight-day / seven-night journey will challenge creatives to explore, expand, and express themselves amongst exciting Greek culture, sacred sites, and mythology-packed adventures. • Visit the Acropolis Museum’s incredible collection of pottery, relief sculptures & exquisite busts. AND OF COURSE... Plenty of time for creative conversation, sketching the gorgeous surroundings, and tons of LGAL led activities! This program will be filled on a first-come, first-served basis based on the order that applications are received. If you are interested in joining with a partner or friend, please be sure to mention their name in the application form! Thank you! Join us on an unforgettable adventure as we explore the busy metropolis of Athens, unforgettable historical ruins, and the countryside of mainland Greece, and the unique mountainous region of Meteora, where Byzantine-era monasteries were built high upon the cliffs, overlooking the vast valley below. The Light Grey Adventure Programs are all about traveling to incredible spaces with like-minded people who want to take in culture, arts, history, and gorgeous natural spaces with their sketchbooks in hand! Whether you are an experienced traveler or someone just venturing out for the first time, we have everything set up so you can just relax and go! Well before you leave the comfort of your home, the Light Grey staff will contact each person to coordinate arrival times and our rendezvous in Athens. Each participant will receive all of the information they'll need to pack, prepare, and get excited about our journey. ***Notice! Traveling before / after the journey! If you are interested in continuing the adventure after your time with us, we recommend adding days AFTER your trip with Light Grey Art Lab, if possible! That way, you’ll be familiar with spaces we’re visiting and can adjust accordingly! Below is a sample itinerary for our trip! Please note that we take into consideration weather, seasonality of the program, and anything else that may disrupt enjoyment of the highlights during the trip and will adjust our schedule where needed in order to provide the best experience to all travelers! Day schedules may be in a different order depending on the group dates / arrival times and if necessary, we will substitute another awesome experience where necessary. As everyone arrives, we'll rendezvous in the city center of Athens and introduce you to the team and to the other travelers! We'll tour the neighborhood, and wander the local spaces and places around our home-sweet-home for the week and make our way to our first stop: the Acropolis! 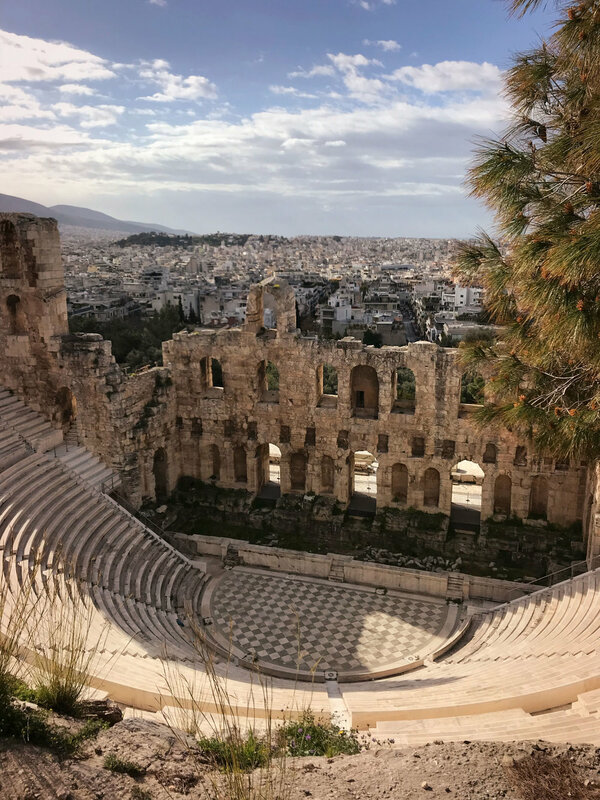 We’ll spend time perusing the ruins, learning about the sacking of Athens during the Persian Invasion, and hear more about the many cults that were once a huge presence in ancient Greece. We’ll take a break to have lunch at a local cafe, where we’ll enjoy the local cuisine, and then head out of town to Lake Vouliagmeni for a dip in the nearby hot springs! In the evening, we’ll stop at the Acropolis Museum to sketch the many reliefs, sculptures and artifacts, and familiarize ourselves with the heroes of the day. Our evening meal will be out on the town on the cobblestone streets of Athens in a local restaurant. After a delicious breakfast at home, we’ll set out through the National Gardens on our way to see the changing of the guard at the Hellenic Parliament Building. The Ancient Agora is our next stop — an archaeological site of political, social, and commercial activity. We’ll have time to sketch and enjoy the roaming tortoises, as well as the artifacts were uncovered from it’s heyday in the Agora Museum. In the afternoon, we’ll head to the Plaka, an area where we can peruse the antique shops, explore vendor’s stalls, and enjoy street-food and refreshments for lunch. Our evening stop will be at the Benaki Museum, founded as one of several museums featuring Greek arts and cultural artifacts throughout the ages. Here, we’ll get a chance to learn more about the local costume, artwork, and artisan works local to the area before dinner out on the town. We’ll wake up early, eat breakfast at home and pack a sack-lunch because we’re headed towards the immense archaeological site of Delphi for a day trip to remember. Here, we’ll learn about the oracle and many of the mysteries associated with this sacred space! Delphi is situated in an incredible mountainous landscape and we’ll have time to explore the grounds and the connecting Delphi Museum, as well as eat lunch among the ruins. At night, we’ve rented a gorgeous mountain house with a pool! The Light Grey team will cook you a family-style meal and we’l enjoy it pool-side as we spend the evening relaxing, swimming, and exploring the grounds. We will start the day after a hot breakfast at home and head to meet Aristotelis Zisimou, Greece’s leading classical pottery restorer, for a hands-on day class in the methods of Greek Classical Pottery! After our lesson, we’ll move on toward Trikala, a gorgeous mountainous area further North, where we’ll settle in to our third and final home. We’ve coordinated a stay on a sprawling homestead with olive trees, almond trees, and expansive gardens just outside the city. In the evening, we’ll head in to Trikala for dinner and an evening workshop in Byzantine-style idols by the Light Grey staff. After breakfast, we’ll head to Kalabaka, a little villiage at the base of Meteora, an area with unique mountains that are peppered with twenty-something ancient monasteries. We’ll stop at a cafe to stock up on pies, cakes, and other lunch items for our journey, and travel by foot up the mountain path to the Holy Trinity Monastery, one of the remaining six monasteries still open today. Here, we’ll view Byzantine-era artwork that has been successfully saved from hundreds of years of exposure to the mountain climate, as well as explore the working monastery grounds. On our hike down, we’ll capture the epic view of the valley below and stop for a plant identification workshop so you can learn more about the greenery surrounding this ancient site. In the evening, we’ll meet with Paraskevi, a local craftsperson living in Kalabaka, who built her stone house from scratch using bespoke materials. We’re looking forward to hearing more about the local culture, rumors, and history of this majestic place. We’ll have a light breakfast and head into Kalabaka to visit the Natural History and Mushroom Museum. Here, exquisite dioramas of animal and plant life depict the many species that inhabit this area. We’ll learn and have a chance to taste some of the local mushrooms gathered on the mountainsides with special truffle-sniffing dogs! We’ll find a nice place to have lunch in town, then head to the Traditional Woodworking School on the outskirts of town. This school is the only school in Greece that teaches the traditional ways of creating intricate designs by chisel, and many of the students go on to create the intricate wood screens seen in the ornate churches throughout the country. Our final stop of the evening will be to drive to the top of Meteora to catch the sunset on a rocky outcropping high above the valley, where we’ll set up for photos and plein-air drawing and painting before dinner in the city. Our last full day will be spent visiting Saint Stephens, another monastery featuring contemporary artwork by a Byzantine style artist. The thousands of paintings inside are incredible and we’ll see in-process works throughout the halls. We’ll also visit the Holy Monastery of Varlaam, a forboding structure built into the side of the rock, and enjoy the views, artwork, and intricate wood carvings inside. The afternoon will be open for discovering the many shops, stalls, and eateries below in the neighboring town of Trikala. We'll enjoy one final breakfast together before heading on the long journey back to Athens. On the way back, we’ll stop at the memorial of the 300 Spartans and monument to Leonidas. If you wish to stay longer, need assistance with recommendations for a longer stay, we'd be happy to help! The Light Grey staff will be happy to help you coordinate your adventure and will be in touch with everyone upon registration to assist with whatever travel needs you may have. *** This itinerary may be subject to changes based on weather or potential fun-opportunities that may arise out of the seasonality of the journey. The Light Grey Art Camps are designed to be fun, full of inspiring adventures & creative challenges including fun creative discussions and activities, and a chance for us to see incredible spaces together and learn from each other! This adventure is perfect for people looking to connect with other creatives over a unique and intimate experience where we'll step out of our comfort zones and have a great time getting to know one another! For more information about Light Grey's other programs, send us a note at hello@lightgreyartlab.com. Greece Mythology & Sacred Sites Tour (8Days / 7Nights) The base price includes lodging, mandatory entry fees to all attractions, guided tours and lectures by experts, museums, and events that are part of the core program, all breakfasts, 3 lunches, and 2 dinners, and transportation from Athens, Greece. We offer payment plans where requested and would be happy help set one up for individuals interested in breaking up the program cost. Upon confirmation of your position in the program, we will reach out to assist you! Our Art Camps are for individuals looking for an intimate, camp-like atmosphere! We usually offer dormitory-style sleeping accommodations with roommates. This program is a special gem! We have coordinated an assortment of sleeping options, and couples are encouraged to apply together in order for us to assign the most comfortable sleeping arrangements for all. Our trips are planned with budget in mind and we do our best to keep the cost down by choosing spaces & places that allow us to share resources on our journey! This program includes all breakfasts, three picnic lunches for our experiences on the go, and two family-style dinners in the countryside. Light Grey Art Camp International trips allow for visitors to experience a wide range of local cuisine per their own tastes. We will be out traveling every day, and will be in populated locations that ofter several options for all other meals. We will do our best to help find establishments that can accommodate participants dietary restrictions, but be aware the Greek diet may vary from your usual fare, so please let us know if you have any allergies and we can try our best to assist all participants with dietary needs as best we can. Some meals are up to the guest during the journey, so you’ll have an opportunity to explore and taste many of the local flavors. Meals are relatively inexpensive in Greece, with the street-food being some of the most affordable (and tasty!) We will be stopping at a grocery store a couple times during the journey to stock up on essentials for meals at home or for additional snacks on the journey. This is a moderate-to-high activity level trip that includes a lot of time spent on foot. We will be walking a great deal, in both cities and mountains. We have coordinated our very own luxury vehicle for the journeys between cities, but we will be mainly walking while in the cities / towns. Participants should be ready to explore on foot and a spend a large amount of time outdoors. The average temperature in Greece in March is 60 degrees fahrenheit, and cooler weather in the evening is common. We always plan for all types of weather, and will provide a packing list to participants in advance of the trip. Flights are not included in the price of this program as people may be joining us from all over the country or beyond! We encourage people to look into flights to Athens International Airport. Anyone wishing to spend more time in the area may also request information on other fun things to see while your'e in town, or recommendations on how to extend your trip! This Art Camp International Culture Tour is 21+. Positions are first-come, first-served. Please feel free to fill out the application form and upon receiving your application, we will contact you within a day or so to confirm your spot. Payments will be due upon receipt, and your position in the program will be confirmed as soon as payment is received. ** Tickets are NON-REFUNDABLE, so please feel free to ask any questions you may have and we will gladly help! We highly recommend purchasing trip insurance for your travels. *Photos taken by Lindsay Nohl, at locations that all appear on this Light Grey Art Camp International trip.